Pirates’ Boat, originally uploaded by Jeffery Simpson. 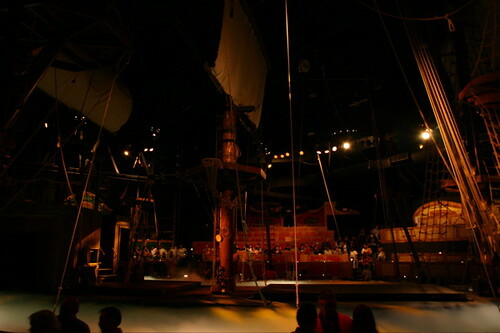 I suspect that the perfect age for Pirates Dinner Adventure [pda] is about six, when pirates are still cool and the thought of eating a meal while a pirate play unfolds in front of you is almost as awesome as being able to watch television while at the dinner table. The trouble with being with a large group on holidays is that you’re going to end up doing some tragically unhip things, such as pirate dinner theatre. More after the jump? You’ll have to check for yourself. Where were we? Pirates, chicken dinner…. a combination that should spell success. Sadly though neither the dinner nor the pirate theatre turned out to be particularly good. I don’t need to know what prision food is like, to know that the meals offered at Piraates Dinner Adventure are not a great deal better than those offered to Federal inmates. The food has that mass produced institutional vibe that you get from summer camp meals, school lunchroom lunches and hospital food. Chicken with a choice between shrimp or beef, and potatoes. Like the food the best that can be said for the acting is that it’s servicable. The plot leads through the standard pirate themes such as: isn’t it great to be a pirate?, isn’t our captain a badass?, isn’t it great to be a pirate?, falling in love with the govenor’s daughter?, boy pirates can be mean and then of course isn’t it great to be a pirate? All of these themes are explored through the magic of song, and sometimes sub-Cirque de Sole acrobatics. The acting is on-par with the animatronic characters on Disney’s Pirates of the Carribbean ride [bla]. If you’re a local don’t go to this, I’m sure you can know a better resturant than this and you can eat your Pizza Hut in front of the television while watching The Muppets Treasure Island [imdb]. My friend and her family went to that a month ago. They had a blast. I want to go!! Y’AARH!! Is it? It’s very hard to tell, not being from L.A., where one begins and the other ends. We just got on our tour bus, and were driven unitl we got there.